St. Columba's is a pastoral-sized parish in a small town in coastal Maine. 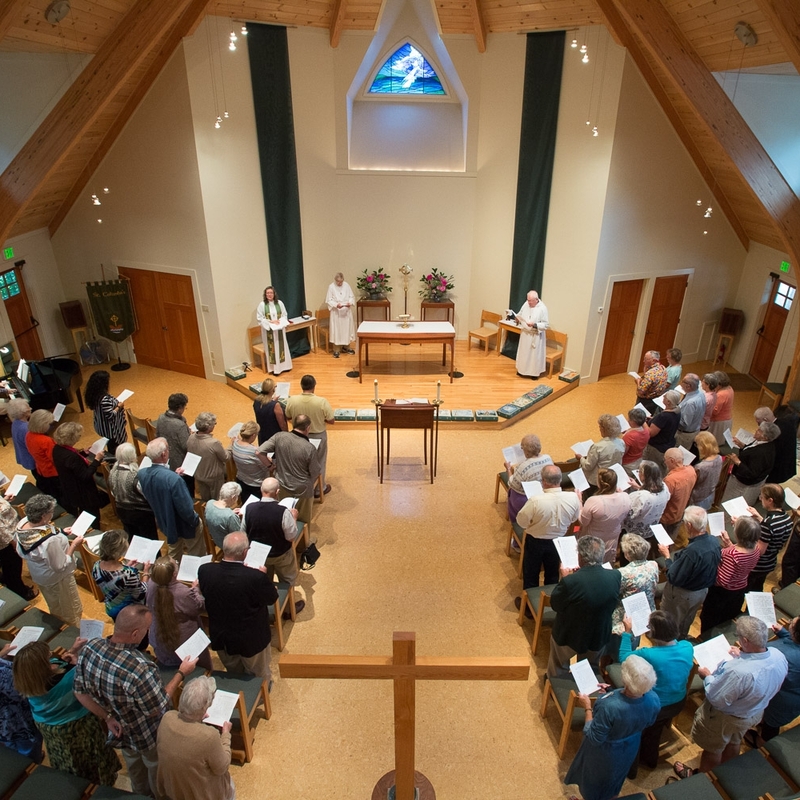 It offers one Sunday liturgy, in a flexible liturgical space. The parish is located in a small town in coastal Maine. The area population is significantly older than the state average (50.71 vs. 42.29), and it is 97% white. Per capita income in 2016 is estimated at $34,212, above the national average of $33,205. Most of the parishioners come from somewhere else, and they found St. Columba's when they moved to the Boothbay region. In the past, parishioners had tended to differentiate themselves from the well-to-do congregants of the summer chapel on nearby Southport Island, but the current rector has worked hard to end the "competition" mentality and build bridges. The chapel board and parish vestry, together with the rector, are exploring areas of mutual interest for possible cooperation. On the Sunday of the site visit, the congregation appeared to be comprised mostly of middle-aged and older individuals, with some young persons present, reflecting the ageing population of the area. The congregation was largely white, mirroring the local demographics. The church building is modern, built with a wide, open sanctuary. A low platform elevates the altar just a bit and provides cushions for those who wish to receive communion kneeling. Two tall, vertical banners in green provide a splash of color on the white wall behind the altar and indicate the season. Rather than fixed pews, the congregation sits in chairs that can be arranged in a number of different configurations. During the week, the chairs are typically removed, creating space for a variety of community events. A large and substantial cross is placed at the entrance into the worship space, with a bowl of holy water on a table at its foot. The ambo and altar are on the same axis with the cross, and the seating is arrayed on either side. Earlier, the rector had explained that the seating is reconfigured in Lent in a collegiate style, with the congregation facing each other across the center aisle in long, parallel rows. When the bishop visits, the seating arrangement is "in the round." That same arrangement is also used in Advent. The worship bulletin is a full-text booklet, containing everything needed for the service, including the music to the hymns. The parish musician is an experienced jazz pianist, who volunteers his time. The instrument is an electronic piano, which suits the space far better than an organ and effectively supports the congregation's singing. Music is drawn from a variety of sources. Much comes from the Hymnal 1982, Wonder Love and Praise, the United Methodist Hymnal, and Songs for the Cycle by Michael Hudson. The parish also draws heavily on the music of John Bell and the Iona Community, as well as Taizé. As the opening hymn begins, the procession enters: two lay assistants, the first bearing a processional cross, followed by the presider, vested in alb and stole. The processional cross is placed in a stand behind the altar—in one sense, it is a bit superfluous, given the much larger and more dominant one near the entrance, but some in the congregation have a deep attachment to seeing a cross directly behind the altar. Processional-style torches have been pre-set in holders on the ambo; in a liturgy with a larger procession, these might have been carried in and out. At the offertory, they will be moved to stands on either side of the altar. There is no choir, or rather the parish lives into the model of "congregation-as-choir." The singing is enthusiastic and quite good. The (optional) collect for purity is used, and this week a "hymn of praise" is substituted for the Gloria in excelsis, Allein Gott in der Hoh, "All Glory be to God on high," a paraphrase of the Gloria. (Normally, a straightforward Gloria from the hymnal is used.) Lay persons come up from the congregation to the ambo to read the lessons. The psalm is recited, rather than sung; the rector intends to introduce the practice of singing or chanting the psalm in the near future. After each reading, there is a period of silence for reflection. Once a year, a professional storyteller comes to St. Columba's, and this happens to be the Sunday. In place of the sermon, she tells the story of Tamar and Judah. The congregation appears fully engaged in the story. The Nicene Creed is recited; the prior week, it was sung in a paraphrased form to a metrical hymn tune. The prayers of the people follow from 3 from the prayer book. After the confession of sin (and absolution), the rector makes several announcements and calls forward those marking birthdays or anniversaries. She prays over these people. The offertory hymn is drawn from the Methodist hymnal, set to a tune drawn from Jean Sibellius's Finlandia. The eucharistic prayer is prayer 2 from Enriching Our Worship, though a misleading label from the 1928 prayer book ("prayer of consecration") is inserted after the Sanctus. (The 1979 prayer book reframed the anaphora as a "eucharistic" prayer, and liturgical theologians have described it as following a more Eastern-inflected approach, in which consecration is a byproduct of thanksgiving. The '28 book and its predecessors could be said to reflect a more medieval Western view, in which consecration was a means of procuring a victim to sacrifice.) While the eucharistic prayer was said, not chanted, the Lord's prayer is sung, using the contemporary form. The printed invitation to communion invites "all the baptized and those who seek a deeper union with Jesus Christ." During communion, prayers for healing are offered by a lay leader in a corner of the worship space. The postcommunion prayer is from Enriching Our Worship. After the blessing, a hymn is sung for the departing procession, followed by a dismissal, with the (Eastertide) Alleluias added. There are a very few departures from the prayer book, most of which are inconsequential (for example, the title, "Prayer of Consecration"). Two are worth considering for their substantive effects: the dismissal delivered from the door after the procession out, and the insertion of the Alleluias into that dismissal. Regarding the timing and location of the dismissal: It may be more powerful, in terms of visual symbolism, to have the dismissal done from directly after the blessing (as the prayer book intends), so that it is done from the altar. This would make a stronger connection between being fed by the sacraments and sent forth into the world. On the other hand, the rector has a reasoned justification for dismissing from the back: it invites the people to make the next move, following the liturgical leaders out. Regarding the use of Alleluias in the dismissal outside of Eastertide: to squander the Alleluias in this way is to leave no festal gesture left during the Great Fifty Days, because it has already been spent, and there is no other cue left to use. However, when the rector arrived in the parish and tried to discourage the use of the "Alleluias" outside of Eastertide, the congregation continued to use them. Given that the rector had managed to bring the parish back into continuity with the prayer book, this is a very slight (remaining) departure. The rector is the chief planner of worship. The church musician is not compensated, and so there are limits on his time. The rector consults with the chair of the altar guild on planning arrangement of the worship space, and she also draws on the skills of a part-time administrative assistant to plan and produce the weekly full-text bulletin. The rector has a broad knowledge of liturgy and music, and the congregation has developed a wide-ranging repertoire of hymns and service music, so there is a good variety in the patterns of worship. She maps the "big picture" of worship one season at a time, and then puts together the Sunday liturgy in a weekly planning session with her administrative assistant. In the near future, the rector will take a Lilly-funded sabbatical to study Celtic spirituality and liturgy. She expects to incorporate some of the fruits of that sabbatical into the worship life at St. Columba's. One of the rector's goals has been to return the parish to a closer fidelity to the prayer book and its authorized supplements. The parish now draws on the full range of authorized worship books, instead of locally made-up texts that varied in quality and had not been authorized for use. Slowly, season by season, the rector has incorporated more classic hymns and more service music into the liturgy during her five-year tenure. Prior to her arrival, the parish had relied on a steady diet of praise music and "baby boomer camp songs," thin on theology and musicality alike. Seasonal repetition of service music has helped the congregation sing with enthusiasm. The turn to the prayer book appears to have corresponded with an increase in attendance. One of the most significant innovations of St. Columba's is the worship space itself. The building has excellent acoustics, and the ability of the congregation to hear itself (for lack of a better turn of phrase) helps people engage more fully in the singing of hymns and service music. The "noble simplicity" of the architecture and the decoration of the interior follow the Liturgical Movement principles shared by the 1979 prayer book itself. The easy flow from the exterior through the wide narthex into the worship space itself, and the lack of barriers within the worship space, reflect the prayer book's ideal of a eucharist that feeds and empowers the people of God for service in the world. The flexibility of the space allows the parish to use the building as part of its mission in the world. There is not a great deal of available "civic" or public space in town. The flexible space allows the parish to host a large number of community events: AA, Al-Anon, Stretch for Life, counseling, concerts, and such like. One of particular importance is a weekly community lunch in the winter, providing food and companionship to over 70 guests each week. Additionally, the church has served as a shelter in storms. In contrast to many small churches, St. Columba's building is in use for a great deal of the week between Sundays. In the transition from a mission that met in borrowed space to a parish with its own building, St. Columba's figured out how to make the building serve as part of its ministry, rather than being a millstone tying it down.